The Ebro River drains a triangular basin with an area of 85.820 Km² in the northern Iberian peninsula, between the Pyrenees and the Iberian Mountains, with the Cantabrian Mountains as its northern border. The river’s course is 928 km long. The river valley receives an average of 18,200 Hm³ of rain and snow. This precipitation is unequally distributed throughout various areas (it could be as low as 300 mm per year in the Monegros, to higher than 2,000 mm in the Pyrenees and Cantabrian Mountains). Precipitation is also quite uneven throughout the year, with long dry spells in summer and frequent storms in autumn and spring. The average discharge registered in the Tortosa gauging station, located 47.8 km from the river mouth, was 13,408 Hm³ per year from 1960 to 1993 (equivalent to an average flow of 425 m³/s) with a maximum discharge of 22,450 Hm³ per year (712 m³/s) and a minimum of 4,283 Hm³ per year (136 m³/s). The irregularity coefficient is 5.2, very much higher than the irregularity coefficient of 2.92 estimated for a 24 years period before the construction of the large reservoirs and extension of irrigation areas. Since the 1930’s, 138 reservoirs have been constructed in the river basin, with a total storage capacity of 6,837 Hm³. This volume is more than half the average annual discharge and close to a third of the hydric content received by the river. 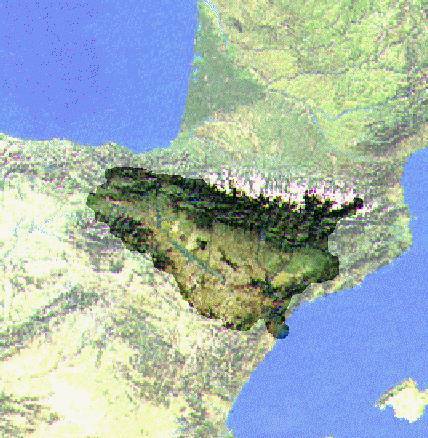 The largest reservoirs, are the Ebro (450 Hm³) in the Cantabrian mountains and Mequinenza (1,528 Hm³) and Ribarroja (210 Hm³), close to the mouth, completed in 1962. These lakes, together with the intensive use of irrigation, have a significant regulating effect on the river flows. But they also imply a heavy loss of flow due to evaporation or evapotranspiration. In the 1950’s, the average annual flow of the Ebro in Tortosa was estimated at 614.64 m³/s (for a period of 24 years), with an irregularity coefficient of 2.92. That means that in a rainy year the flow can be three times the flow of a dry year. This average annual flow is equivalent to a total annual discharge of 19,286.37 Hm3, with is a loss of about 6000 Hm3 per year compared to the 1960-1983 period. The river flow shows high variations between the rainy and the dry seasons. Peak-flows occur in winter (the rainy season in the Cantabrian mountains) and at the beginning of the summer (snow melt in the Pyrenees). The minimum stage occurs between July and August (the dry season in the Mediterranean climate). The above chart shows the annual flow variability (mean flow in m3/s) from the Cantabrian (Arroyo gauging station, with cold Atlantic climate) to the Tortosa gauging station (Mediterranean climate). In the Tortosa gauging station, the mean flow of March is 695 m3/s while the mean flow of August is only 178 m3/s. However, in some very dry years (1929, 1949) the flow was only of 32.8 m3/s.. Today, the minimum ecological flow is 100 m³/s in addition to 50 m³/s for the delta irrigation canals. One of the most important effects of the annual variability are the important floods that occur mainly during the storm period of autumn, but also in spring and winter. 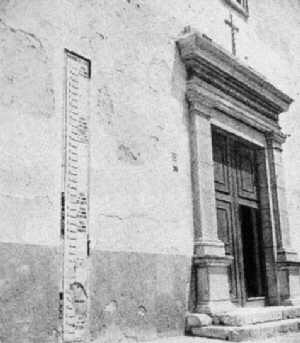 Graphic gauge in the facade of the Xerta church, near Tortosa, together with a table showing the main floods, estimate of maximum flows and the water level in the Xerta gauge. The historical data of floods are difficult to interpret because they register mainly personal and material damages but do not estimate flows. However a graphic gauge in the Xerta church (see image) reports the stage-level of the main floods since the 17th century. In the 1787 flood, water reached a level of 10.05 m above the river bed that still is the maximum one ever registered in Tortosa. It follows the 1907 flood with a level 9.95 m and a peak-flow of 23,484 m3/s (see hydrograph). It is nearly impossible to repeat these flows in Tortosa because of the regulating effect of the reservoirs. The peak-flow in the flood of November 1962 was only 3,200 m³/s and in January 1977 it was 2,600 m³/s, when in both cases the precipitation surpassed levels recorded in 1961 and 1937.